Current Status: Hero Dogs Graduate, partnered with Veteran Tim T.
Most people praise me for my simple sweetness, but I know just how handsome I am and how to work it. I worked my silly, goofy charm on a segment of "Good Morning Washington" for the Carhartt Fashion Show at the National Harbor. My tail wouldn't stop wagging for almost the entire show. Of course my eyes never left my sidekick and I did whatever she asked as any good service dog would... for some yummy treats! After the actual fashion show, Becca took me on the National Harbor Ferris Wheel. I enjoyed the views and did what I do best... take a nap. My favorite Hero Dog to pester or shower (depending on your point of view) with my love kisses came up to Hero Dogs to visit me with his Veteran! 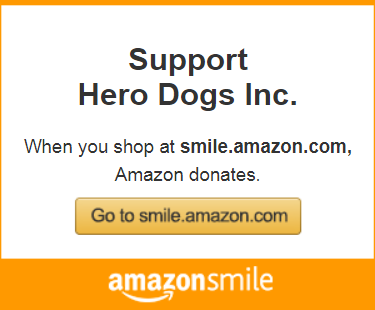 OK, so maybe HD York actually came to Hero Dogs to do some training, but a dog can dream, right? Speaking of kisses, Ms. Jennifer brought this weird-looking dog (if you can call it that) into Hero Dogs, and she (the new puppy) keeps trying to give me kisses. Yeah, I don't accept those kisses! Don't judge me! Jennifer and Becca make sure I stay busy between my many naps during the day in the kennels with loads of events. This sweet handsome boy is the favorite of many volunteers, but especially Barbara! I've been the #1 pick for CFC events so far this year. 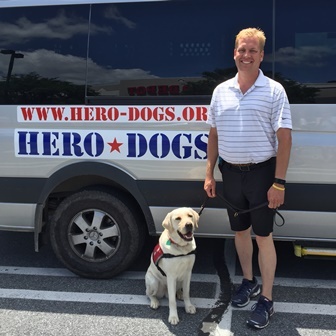 At the CFC event at the Office of the Director of National Intelligence, Robbie and I showed how well trained service dogs are compared to two explosives sniffing dogs who were at a table not too far from us. The other two dogs REALLY wanted to say hi, but Robbie and I remained focused on our handlers like the awesome service dogs we're supposed to be. Advanced training isn't all work and no play. Jennifer and Becca both make sure to make training fun. I always seem to be caught with something funny on my big head. For being such a big and solid guy, it's only natural for me to work on mobility in case I'm paired with a Veteran who needs a little extra help getting around. *YAWN* It's time for my next nap. Maybe the next time you hear from me I'll have a Veteran of my own. Click here to read Mitch’s full blog.